Recognises an antigenic determinant shared among products of the HLA A, B and C loci. 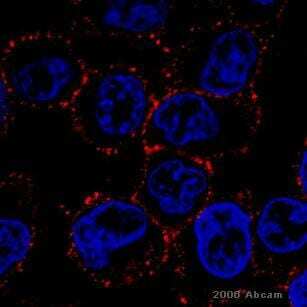 The antibody recognises virtually all nucleated human cells. It recognises an antigenic determinant shared among products of the HLA A, B and C loci. Clone W6/32 recognises a conformational epitope, reacting with HLA class I alpha3 and alpha2 domains. Tissue, cells or virus corresponding to Human HLA Class I. Tissue/ cell preparation of membrane of tonsil cells (Human). FACS: Human peripheral blood lymphocytes. ICC/IF: HeLa cells. Our Abpromise guarantee covers the use of ab22432 in the following tested applications. Use 10µl of the suggested working dilution to label 106 cells or 100µl whole blood. See Cabrera CM et al reference. Staining of human peripheral blood lymphocytes with ab22432 (red). ab22432 at a 1/100 dilution staining unpermeabilized HeLa cells (Human epithelial cell line from cervix adenocarcinoma) by Immunocytochemistry. The cells were paraformaldehyde fixed and blocked with 10% serum and incubated with the antibody for 1 hour. Bound antibody was detected using a Goat anti-mouse TRITC antibody. This image is courtesy of an Anonymous Abreview submitted on 12 April 2006. Publishing research using ab22432? Please let us know so that we can cite the reference in this datasheet. I would like to ask if the light chain for the antibody W6/32 is gamma or kappa light chain. Thanks.